Door County Economic Development Corporation > News > DCEDC Workforce Taskforce Gives Away a Scooter! DCEDC Workforce Taskforce Gives Away a Scooter! 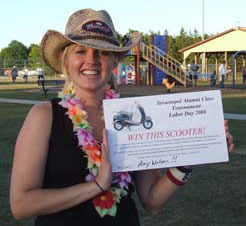 Amy Nelson, a radiology technician from Green Bay and a 1999 graduate of Sevastopol High School, was the big winner of a new scooter as part of a giveaway organized by the Workforce Taskforce of the Door County Economic Development Corporation (DCEDC). The giveaway was held during the annual Sevastopol Alumni Sports Tournament over recent the Labor Day weekend. The giveaway, sponsored by Door County Memorial Hospital, Therma-Tron-X and Port Plaza Auto of Door County, gave the Taskforce the opportunity to raise awareness of locally available career opportunities to the hundreds of Sevastopol alumni and spouses attending. The Taskforce is targeting local high school reunion groups as an avenue to recruit graduates to return to Door County and become part of the local workforce. Any local parents and former students who are interested in learning about local job opportunities are invited to share their contact info with DCEDC to receive information in the future. Visit http://www.doorcountybusiness.com/pdfs/Responseform.pdf to fill out and submit a brief questionnaire. The DCEDC Workforce Taskforce – made up of human resource executives and business owners from the County’s leading employers – is striving to ensure the future stability of the local business community through innovative workforce development programs and initiatives. The Taskforce has also developed programs to entice Coast Guard personnel to make Door County their home after leaving the service and will hold education sessions on recruiting and retaining older workers. The Door County Economic Development Corporation (DCEDC) is a public/private partnership dedicated to improving the economic vitality of the county and its residents. Founded in 1989, DCEDC has been successful in helping existing businesses create and retain thousands of jobs through a myriad of programs and initiatives. Additionally, DCEDC places strong emphasis on fostering entrepreneurial instincts in county residents as well as those who vacation on the Door County Peninsula. Door County Economic Development Corporation offices are located within the small business incubator DCEDC founded in 1997 at 185 East Walnut Street in the Sturgeon Bay Industrial Park.